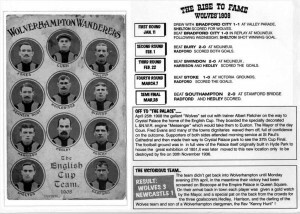 Picture Postcards Record Past Heroes of the Beautiful Game. 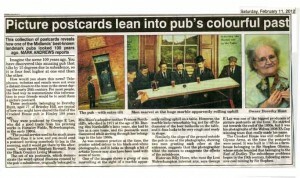 A small feature in the Express and Star on Saturday the eleventh of February 2012, written by Mark Andrews, featured a collection of postcards regarding the “Crooked House’ Pub in Himley at the turn of the century. Mark said, rightfully so, they were printed by George E. Lee. 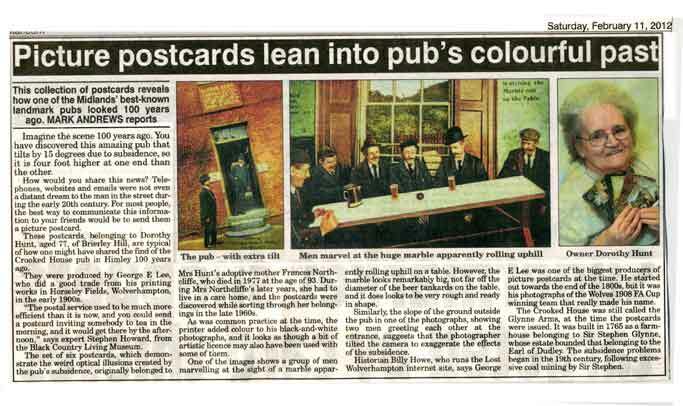 Also in the article Mark quoted me as saying; That under the banner of The “Wulfruna” Series he was the biggest producer of local postcards in his day. from his shop in Horseley Fields as well as his stationary Stall in the Retail Market Cheapside. 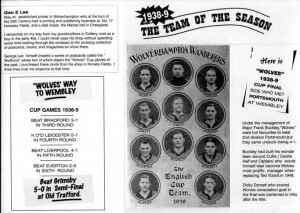 I have collected many of George Lee Souvenir postcards over the years and it is my opinion that the first two that that came into my possession, two, depicting “Wolves” cup teams from the past, bought new from his shop during the war, will forever keep the name of this prolific printer and stationer alive, incidently these originals now sell at prices in excess of £30. 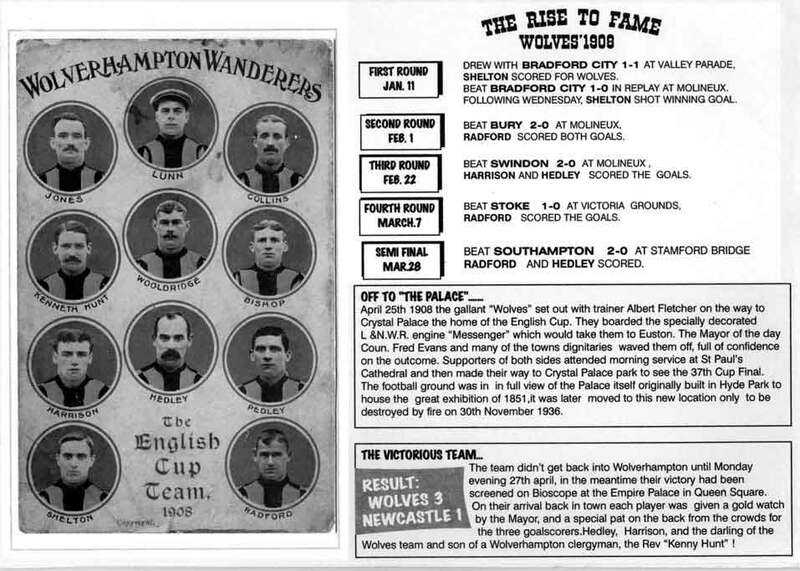 George E. Lee promotes two of the Wanderer’s Cup Runs with two of his famouse Postcards. Now isn’t it typical of the “Wolves. 1939 – “Well what can you say” . 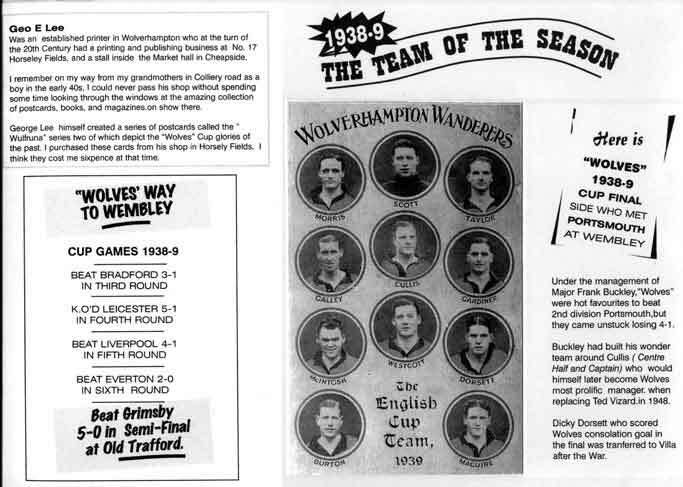 Favourites or not, when you rely on the Wolves they always seem let you down. « Home of a genius and the Sunbeam car. Hello Robert is there more to of this story?